Every Christmas, for as long as I can remember, I've made my girls jammies. This year, I couldn't rationalize new jammies, when even though they each had drawers stuffed with them, they would rather wear one of their daddies XL t-shirts to bed. So this year, I decided I would make them each a new cozy, colorful, layer for their beds. This was such a simple, and quick project! It really only took about 3 hours to make each one. It has a patchwork top and a blanket underside, all held together with yarn ties spaced across the top. 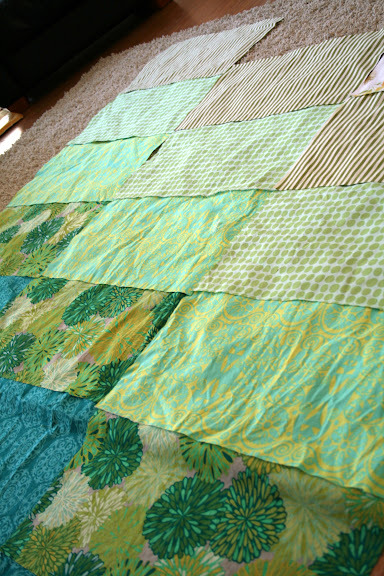 Sewing time will vary depending on how large your patchwork blocks are. I started with a twin size microfiber blanket from Target (which cost $13). 1) Measure your blanket. (mine was 66 x 90) Decide what size and shape you want your quilt blocks to be. I made my blocks 22 x 10, then added an inch to each dimension for seam allowances (23 x 11). I then decided I would make 3 rows of 9 blocks and then off set the blocks in each row for a bit of interest. 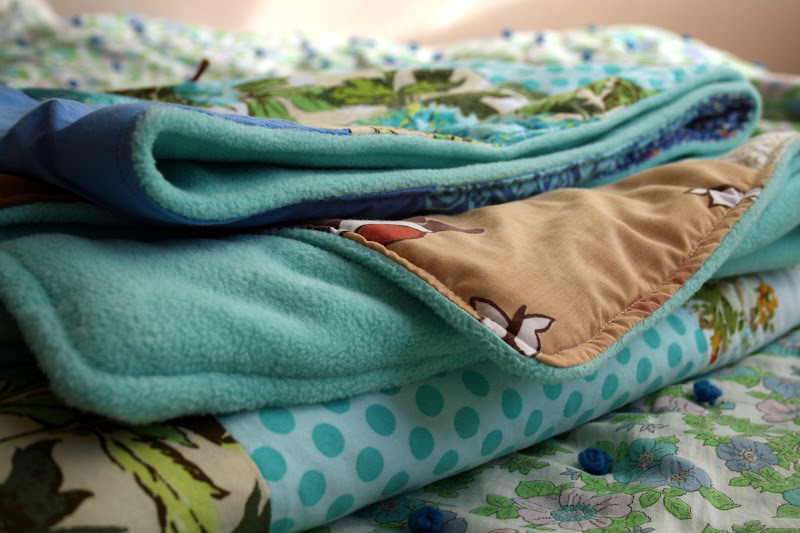 3) Lay your blanket on the ground face up, smooth and straighten it. 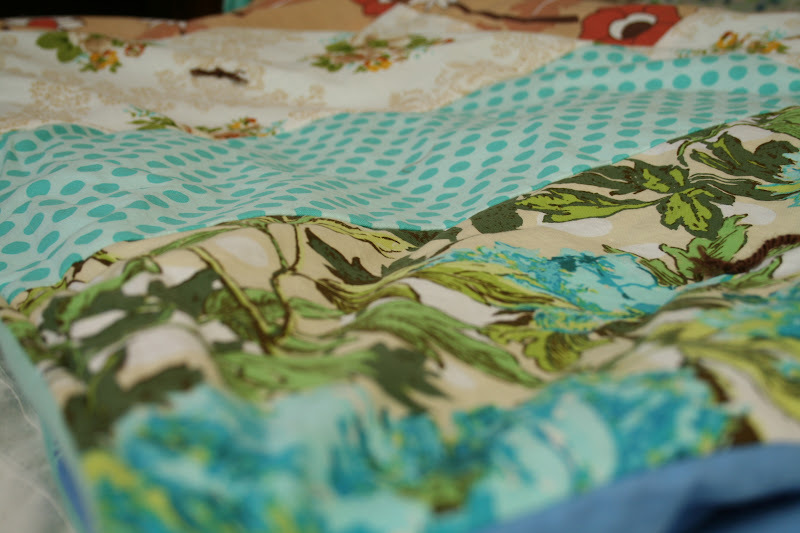 Lay your patchwork over your blanket face down, smooth and straighten it. Pin your edges together. Sew your edges, leaving about a 12" spot open to turn your work right side out. 4) Turn your work right side out, and poke your corners out. I didn't iron my edges this time. I was afraid of putting the iron on the microfiber, and the blanket had enough stiffness that I was able to go ahead with the next step. 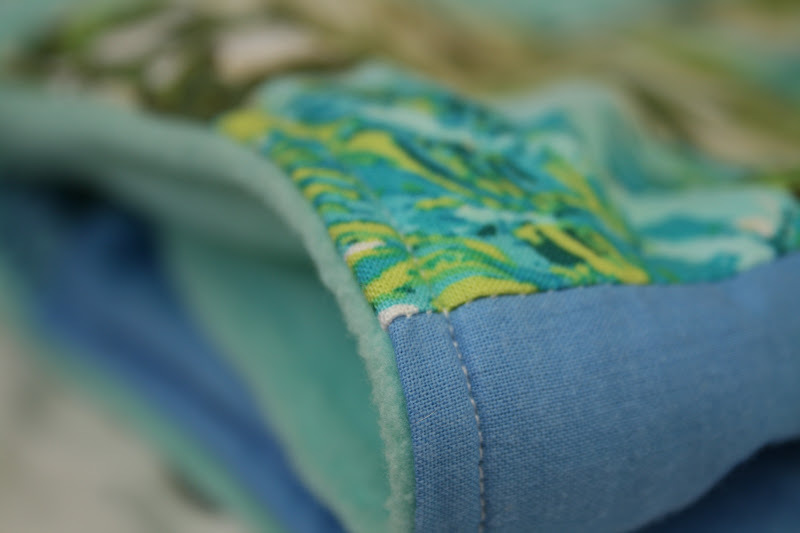 5) Top stitch the outer edge to make it look nice and tidy. 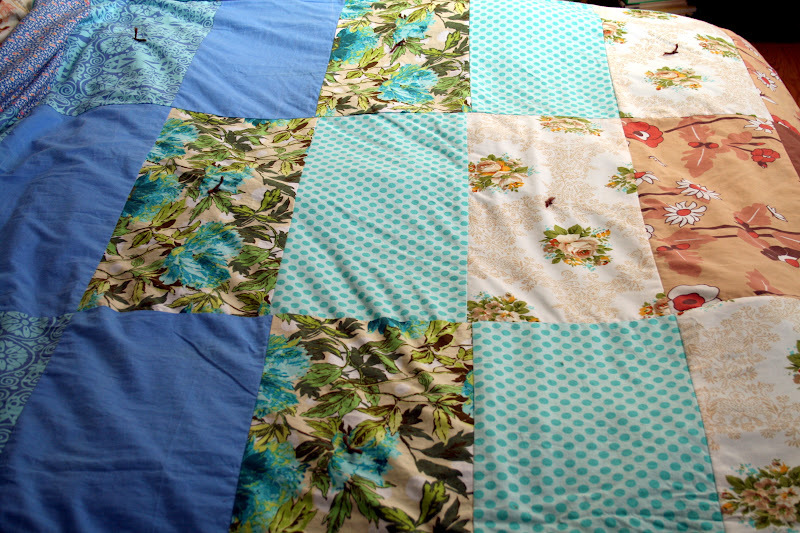 6) Lay your new patchwork quilt out on the floor again, and smooth and straighten it. Tie both layers together using a yarn needle and yarn. This keeps the layers from slipping around and looking sloppy. I put one yarn tie in the middle of every other fabric block. This patchwork quilt works great as a layer to cozy up your bed, or for a lightweight coverlet on warmer nights. My girls love the cozy underside, and the colorful topside. You could even make this using a sheet on the top, and fore go the patchwork step altogether.